Superior quality sequins have been used along with golden thread embroidery to create this beautiful design on the evening gown. The design reflects dual colors, one is green and the other yellow thus adding a soft touch to the entire gown. The design is extremely delicate and is fragile to look at. 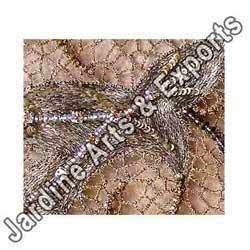 Silver bead embroidery have been interestingly stitched with the help of superior quality silk threads. The beads have been attached with the help of silk thread forming a honeycomb design thus making it an interesting design. The design reflects high levels of fine craftsmanship and the finishing is next to perfect. 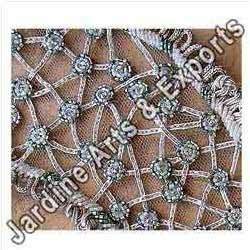 Looking for Party Wear Embroidery ?